A specially formulated blend of Sweet Almond, Peppermint, Eucalyptus and Rosemary Essential Oils specifically chosen to revitalise & soothe the feet. 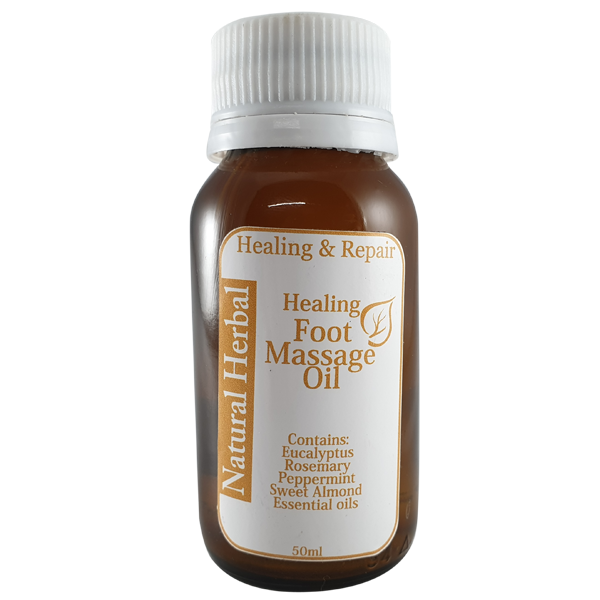 Healing & Repair Range Healing Foot Massage Oil contains Sweet Almond Oil enabling a smoothe massage with gentle slip. Sweet Almond Oil also has healing and rejuvenating properties much needed by tired feet. Peppermint Essential oil has antimicrobial benefits, soothes and cools the feet and thereby reduces swelling. Eucalyptus Essential oil has anti-bacterial qualities, enhancing the all over health of the feet. Also containing Rosemary oil which has antifungal qualities. The selected Essential Oils works together synergistically in keeping the feet clean, soft and healthy. Pour a few drops of oil into the palms of the hands and massage the feet. Leaves feet feeling fresh, rejuvenated and relaxed.